The White-bellied Caique or White-breasted Caique has a very active nature Guaranteed to get into anything and everything it can! The White-bellied Caiques are not only some of the most colorful birds in the parrot family, but are very intelligent and quick to learn tricks. They are affectionate, inquisitive, and love to show off. This subspecies, the White-bellied Caique or White-breasted Caique, is found in South America along the upper Amazon river, specifically in Brazil. They inhabit the forest canopies in tropical zones. 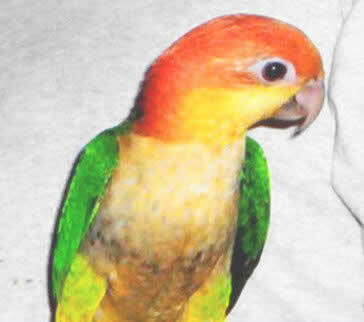 All three subspecies of White-bellied Caique have a mostly orange colored head with the lores, sides of the head, and the throat being yellow. The back and wings are green and the breast and belly are primarily creamy-white. The beak is horn colored and the eye is reddish-brown. The White-bellied Caique is distinguished from the other two subspecies by the green feathering in its thighs, it is also a bit smaller than the Yellow-thighed Caique. On juveniles the head is more brownish scattered with black feathers, the beak has gray markings by the base, and the eye is brown. Mature birds are about 9" (23cm) long from the head to the tip of the tail. Caiques enjoy human interaction as well as interaction with other birds. In the wild the Yellow-thighed Caiques are very social birds usually seen in pairs, a family group, or a small flock. They are highly social birds with a very active nature. They will require a lot of interaction with either you or from another companion. But despite this overall affectionate nature, some can get rather grumpy and nippy and can be aggressive to other birds. They should never be left unsupervised with other pets. White-bellied Caiques are a challenge to breed, however they are being bred successfully. The female will lay two to four eggs which incubate for about 27 days. The male will feed the female while she is brooding, and will join her in the nest box at various times during the day and at night. The hatchlings will leave the nest at about 10 weeks. Like most parrots, the caiques are quite hardy when provided a good environment and proper care. See About Caiques: Potential Problems for more information. Caiques in general are not as available as other parrot species and are quite a bit more expensive. This White-bellied Caique, Pionites l. leucogaster, is the most common of the three subspecies and is occasionally available. I've been raising caiques for 17 years and I'm still figuing it out! It is normal for hen to pluck chest this helps to keep eggs warm and is a good sign for future babies! I would just take out broken egg and leave the rest alone. Sometimes they eat an egg trying to get more calcium. When you notice they have started breeding add 1-2 almonds daily and a small piece of hard cheese to their diet. Best to just stay out of nest box unless checking or marking eggs( with water based magic markers) I once pulled out male like you did and hen killed her baby! Also always trim nails when you notice breeding cuz sharp male nails on hen will hurt her and no proper contact is made! I have a pair of White-Bellied Caiques male and female, she is 7yo and he is 5 yo. She recently laid three eggs. one was cracked and there was nothing inside I took the other 2 out froze them then warmed them and replaced them in her nesting box that she loves. I left the eggs in the box for approximately 2 weeks, then I removed them. I spent a lot of social time her so she wouldn't get to freed out, but I noticed that she started plucking her chest feathers. I have the birds separated in a very large cage and I have been keeping the male on his side unless they are on an outside perch. I don't know what to do with her as far as the plucking is concerned. Does anyone have advise with this problem, instead of taking her to the vet. The closest one to me is 30 minutes away and expensive. Please help..
Are they loud make much noise live in a condo? Would love to have one just worried about noise for neighbors. They are expressive in their little tweets and sounds but they are not loud. I don't see any way that a neighbor in a condo would hear them. Not as loud as a microwave beeper or shower running. They are vocal (not words) but can express themselves but just not loud. They are essentially the comics of the parrot world and a lot of fun. They pretty much get along with everything and everyone. This is a great first bird, also. Much much fun. I have had my caique for a little over a year...she can be loud at times. As I'm typing she is screaming in her cage. Just say where you are. She can't see you and she hears someone in the home and gets scared cuz she can't find her 'flock'. She just wants to make sure you are there and not a stranger. If she knows it is you - she won't be upset. If you are at work, they play. There isn't another person in the home so its quiet. If you are home, they want to be with you. Love caiques, they are curious and stubborn. they like to be envolved in eveything you are doing. their sounds are not unpleasant like the conures they like to be talked to and whistled to and always respond back with a whistle and some birdie speak. Mine like to be with you all the time while you are doing chores. they explore every cup and bowl they see, and are not shy birds, Caiques are high energy pets and dont get tired like other birds this means keep an eye on them while the are out of the cage. they are fearless compared to other breeds. very big eaters and are not picky. Mine plays very rough like kitten on its back biting and scatching [wrestling] lot of fun all the time love love these little powerhouse birds. yes, my caique always squawks when ever i get home from a long day out. they grow really close to you, so now every time i walk in, she greets me with a squawk, glad to see im home.